Although she now lives in the UK, writer and performer Katherina Radeva grew up in Bulgaria. In Fallen Fruit, a piece she started working on in 2010 and returns to now in a markedly different political climate, she explores her memories of growing up on the other side of the iron curtain. 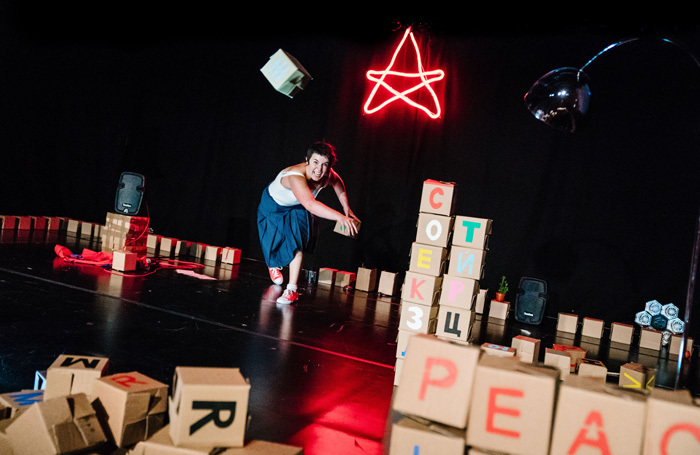 Standing on a stage strewn with cardboard boxes marked with the letters of the Bulgarian Cyrillic alphabet, which also resemble Sofia’s identical grey apartment blocks, she wears the uniform of a young pioneer – the youth wing of the communist party. Radeva also tells the story of two women, lovers, one of whom bucks against the control the state has over their lives, the other finding it reassuring. She discusses the impact of the events of 1989 on their lives: the fall of the Berlin Wall, the food shortages that followed, and the sense of terror that people felt that it was all some kind of trick or trap. The piece is full of fascinating details, such as the single shared telephone in her apartment building and the near ecstasy of Nesquik after a diet of pig lard. Radeva is an engaging presence as a performer but Alister Lownie’s production is padded out with long game-show sequences that don’t quite work. It feels fragmented and fuzzy, although the sight of Radeva hurling herself around the stage in front of a red neon star, until she is breathless and sweating, is a potent one.